Identify, selecting, and preparing clinical trial sites to conduct a clinical trial is an ongoing struggle for sponsors looking to run bigger and more global clinical trials. For some indications, this can be an especially tricky proposition. Increasingly, pivotal phase 3 trials in Alzheimer’s disease are required to screen, and eventually randomize, exceptionally large numbers of patients. The result has been the requirement for a very large number of centers to be identified, globally, for every new program. An analysis of currently recruiting, industry-sponsored, phase 3 intervention trials listed in ClinicalTrials.gov shows an average of 67 centers open for each trial, and 7 studies with more than 100 centers. Bracket has traditionally focused on providing technology to investigators that will allow them to better collect outcomes data in these trials. And in training and certifying the sites and site personnel who will execute a trial. However, there are things that can be done even before this happens that will improve your chances of signal detection in your trial. The selection of investigative sites to participate in clinical trials is often focused on evaluation of historical therapeutic experience, past subject recruitment and regulatory compliance records. However, in these difficult trials, we already know the very subjective Clinical Outcomes Assessments can be difficult to administer, and identifying sites, investigators, raters who have demonstrated competency with these instruments in past studies can be a meaningful strategy. At Bracket, one approach we’ve taken is to bolster traditional site feasibility data with additional metrics utilizing historical clinical outcome assessment administration performance data. In research that was presented at the 2015 Clinical Trials on Alzheimer’s Disease Conference (CTAD) conference in Barcelona, sites were able to be stratified using this performance data, giving sponsors an additional criteria to assist in their evaluation. Since potential recruitment numbers, and past recruitment experience, is so important to the feasibility process, it’s important to evaluate recruitment in the context of these performance data as well. The evaluation of clinical outcome performance criteria can be an important component of improving study execution. In this study, a methodology was developed to evaluate historical experience and clinical outcome administration performance data as a mechanism to enhance site and rater selection. 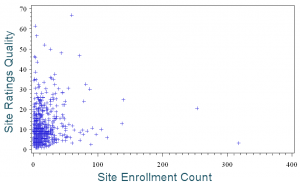 Historical data shows only a limited correlation between sites with high or low performance quality, and sites with high or low recruitment rates. So combining both factors in your feasibility process is essential. And in some cases, it can still be valuable to invest the time in initiating a site that may have very limited recruitment, if you can have greater confidence that they will enroll good patients, and provide high quality data. Later this month, at the Alzheimer’s Association International Conference in Toronto, Bracket will be presenting some of our most recent data evaluating how we can help support your global clinical trials. To schedule a demonstration or time to discuss these tools and services, please use the contact form.